Are you ready to harness the full power of online communications to do more good in the world? 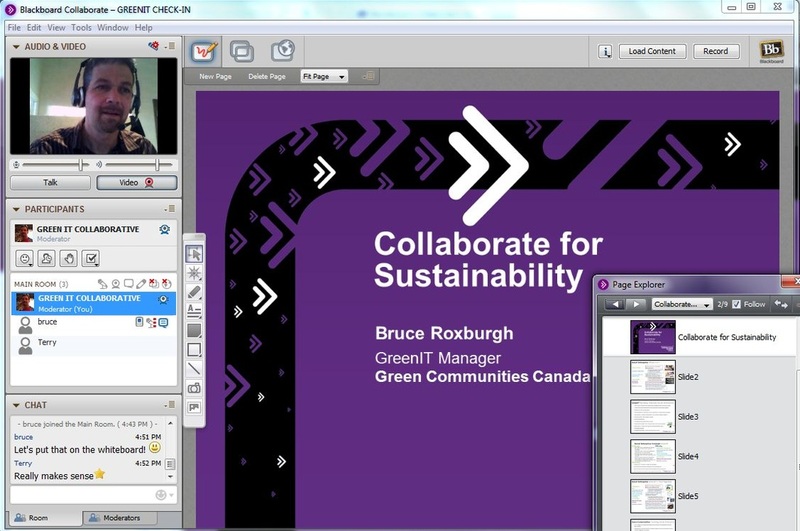 GreenIT offers affordable access to Blackboard Collaborate, a multi-featured web conferencing tool. Blackboard Collaborate will change your life for the better by improving workplace communication and making collaboration easy and fun. host interactive sessions for staff, board, partners - it’s the next best thing to being together in person! Blackboard is a leading provider of online learning software to educational institutions across North America. GreenIT has developed a unique partnership to make this powerful tool available to Canadian non-profits at low cost. Most web conferencing tools are pay-as-you-go. Our year-by-year subscription packages provide you with unfettered access to your own private web conferencing room, any time of day or night. No need for pre-booking. And there’s no additional cost, regardless of how often you use the system. You are free to explore all the ways this technology can help you do more good in the world. Do you have one specific need or several projects on the go? GreenIT can build your organization a package that offers you the room you need to soar with the support to do so with ease. We too are nonProfit - we will help you find the best solution for your needs and be your partner meeting those needs.